Yaegaki's Junmaidaiginjo, a top quality sake brewed from rice grains milled to half of their weight or less, is recognized worldwide. This traditionally brewed sake remains timeless by virtue of the vibrant colors it lends to contemporary cuisine. Yaegaki shuzo's Japanese sake is characterized by its traditional brewing technique, "Futakojiho", isn't it? 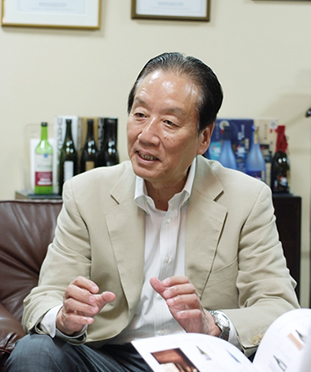 "The sake of Yaegaki, to the world,"
the 14th generation family head, President Yuzo Hasegawa. Our signature product, "Kuronomu" is a special sake brewed according to a traditional technique, "Futakojiho", and is directed and produced by Hirokazu Tanaka, who is widely regarded in the industry as "the master craftsman of his day". The most important part of sake brewing is making Koji, the rice malt. The "Futakojiho" technique, utilizes flat boxes of 60cm in length, 40cm in width, and 5cm in depth, and one sho, which is approximately 1800cc, of rice malt fits is processed in this fashion. We prepare numerous batches, and pay careful attention to the quality of each box. Typically, big boxes are used to produce Koji, and often feature in demonstrations of this involved process. The clearest way for us to illustrate how our process differs from the norm is to point out that we carefully prepare smaller portions of them. These days, it is rare for a brewery to manufacture its own yeasts, almost entirely by hand, and commit to this traditional method, which requires a great deal of time and care. 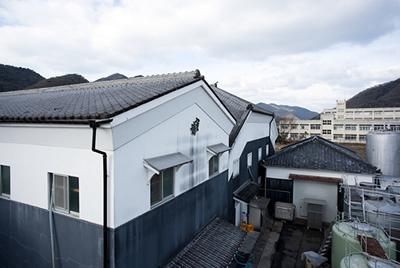 We devote our time and efforts towards producing a genuine sake. Our respect for tradition and quality is probably best described as, "making sake with heart". 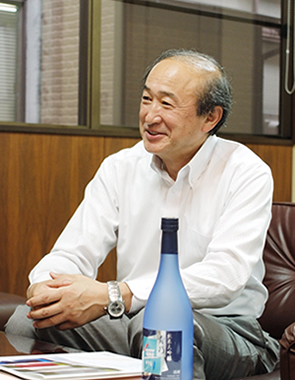 We begun to develop our current method forty years ago, but our technique is informed by 350 years of our company's history and philosophy, a long tradition and commitment to protecting Japanese heritage and the essence of sake. You expanded your business internationally and are now managing diversified businesses? 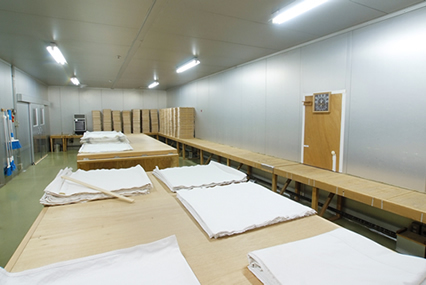 The koji making room, where koji is prepared. The work of making koji is said to be the heart of sake brewing. The Yaegaki flavor is made through the traditional "futa koji method." Our mission is primarily to conserve and promote Japanese sake culture. We first expanded our business overseas in 1987. "Yaegaki Corporation, USA" was launched in Los Angeles, and now produces sake at local factories and from there distributes its products. Seeing our products accepted in America, and appreciated in a wine glass as an accompaniment to a Western meal, gave us a sense of the potential for our product to tap into new cultures, and further develop our market presence at home. We have also been running diversified businesses based on "fermentation engineering". We currently manage four companies including Yaegaki Sake & Spirits, Inc. 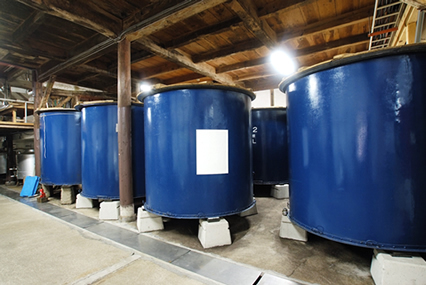 I believe we are a rare brewery that has developed associated industries around Japanese sake. Please tell me about your signature product "Mu". Our sake features a light, fruity aroma with a solid and clean taste. The ideal characteristics of a Japanese sake is a clear and sharp taste. "Junmai Daiginjo Aonomu" is a product that delivers these qualities in most well-balanced manner. As a drink to be consumed with a meal, it is very versatile, complementing not only Japanese fare, but proves an ideal accompaniment to a diverse range of cuisines, for example, Chinese. We believe in communicating with customers through our products. In order to instill and promote a renewed appreciation of Japanese sake in our every day life, we have focussed on conveying messages with an emphasis on our culture and mission, rather than merely focusing on profits. "Mu" is a brand that aspires to evoke the timeless idea of "Always going back to our origins", and its package is designed to describes the gift, beauty and elegance of Japanese nature. This product is also very popular in America. This bought us to the realization that our Japanese sake is appreciated worldwide. I understand that you launched an outlet store in JR Himeji station's shopping center, "piole" as a new project? and waits to be bottled with a stylish label. Yes, we opened this store in March 2011. We communicate our thoughts through our products, and we listen to our customer's voice through our products too. We opened this store to amplify the customer's voice at home, and to promote our sake in a more local fashion. Other than this outlet store, we actively promote new ways to enjoy Japanese sake by holding events such as a grand tasting where we introduce the year's new sake to customers, in an international spirit that celebrates Jazz, French cuisine, and Yaegaki's sake. We believe that these days a fine Japanese sake does not demand a Japanese cuisine, indeed, it is not strange to see a Japanese sake served next to wine. We will continue to express new styles and applications of traditional sake brewing in our own way. Face of Yawegaki was brewed "Yamada Nishiki" and "Gohyakumangoku"with carefully. Please enjoy the crisp and clean and fruity fragrance. Taste of "Omachi" is rich. The popular products suitable for a present label sophisticated design. Junmaishu that can be tailored to a wide range of cuisine. As a single decorate the dining table daily.